60 Value For Money Better Options? 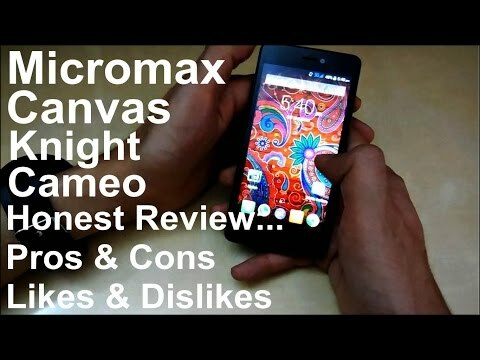 If you own Micromax Canvas Knight Cameo A290, please do leave your feedback too. Lowest price of Micromax Canvas Knight Cameo A290 price in India starts at Rs. 7,999 Micromax Canvas Knight Cameo A290 is available on Flipkart at Rs. 7,999. Prices updated on 23rd April 2019. Micromax Canvas Knight Cameo A290 is a mid-range phone. It is one of the best phone that Micromax has ever made with a good processor and exceptional looks. Knight Cameo is powered by 1.4GHz Octa Core processor. Micromax calls it to be a TRU Octa Core phone, meaning all the eight cores run simultaneously. This, on paper, would make the phone faster but at a cost of battery draining quickly. It is coupled with 1GB of RAM that helps this device multi-task and switch between apps quickly. It has a 4.7 inches IPS display with a resolution of 1280 x 720 pixels which is very decent. What is more impressive is that it has a pixel density of 312 pixels per inch, making the display content crisp and content will be more enjoyable and life-like. It is running on Android 4.4 KitKat and will ship with Google Now Launcher instead of Micromax's custom launcher. Canvas Cameo A290 has a 5MP front camera and a 8MP rear camera which is a good package for photography needs. The front camera is a fixed focus type while the back camera is autofocus type. It will come with modes like Object Eraser that shoot multiple photos and removes objects and Cinemagraph that mixes GIF with videos. Users will be able to record 1080p videos as well. It has only 5GB of space available to the user out of 8GB internal memory. But there is a microSD card slot that takes care of expansion till 32GB. Back of the phone is largely plastic with a glossy look. It is removable and youll find a decent 2000mAh battery underneath. The said talk time is about 7 hours. It is available in White Gold, Black Gold and Pure Black.